Come see on of Connecticut’s best attractions and experience a piece of CT history. The former castle home of actor William Gillette enchants visitors with all of its intricate locks, hidden doorways, secret mirrors and amazing craftsmanship.The rather eccentric Gillette, born in Hartford in 1853 and best known for his portrayal of Sherlock Holmes, first spotted the location where he would build his castle on a boat trip up the Connecticut River in 1912. 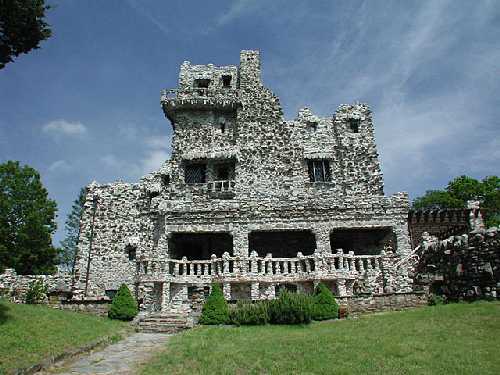 Gillette Castle, built at a cost of about $1 million and completed in 1919, features a number of peculiarities including hidden mirrors, a lock-protected bar and intricate, hand-carved door latches on each of the castle’s 47 doors: No two are alike.When Gillette died in 1937, his will insisted that the medieval castle he’d built not fall to “some blithering saphead who has no conception of where he is or with what surrounded.” The state of Connecticut acquired the nearly 200-acre estate in 1943, and it has been a public park and one of Connecticut’s most popular and intriguing attractions ever since. In 2002, a four-year, $11.5 million restoration project was completed. While the castle is the main attraction, the grounds are equally spectacular, providing scenic river views and opportunities for hiking and picnicking. Getting there…Gillette Castle is located at 67 River Road in East Haddam, Connecticut. From Route 9 North or South, take Exit 7 for Route 82. Follow Route 82 East through Goodspeed Landing, and watch for signs directing you to the park. Hours and Admission… Gillette Castle State Park is open from 8 a.m. until sunset year-round. Self-guided castle tours are offered continuously from 10 a.m. until 5 p.m. daily (purchase tickets by 4:30 p.m.) from Memorial Day weekend until Columbus Day. While admission to the grounds is free, there is a charge of $6 for ages 13 and over and $2 for children ages 6 to 12 to tour the castle as of 2012. Children 5 and under are admitted free. Call ahead to make special arrangements if you are bringing a group. For more information… Call 860-526-2336. This place was out of this world. I would have never imagined it to be so much fun. Mr. Gillette sure did know how to make the best out of any situation. Incredible! The woodwork is simply marvelous. A CT treasure for sure! 5 stars.